"A very quick and easy (and tasty!) 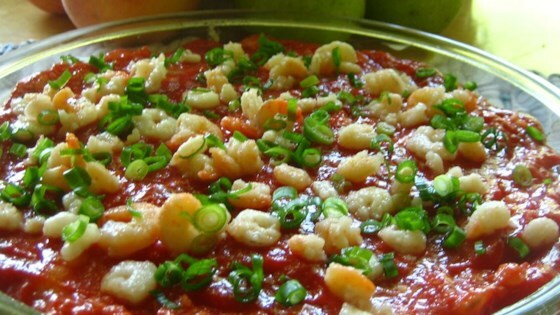 shrimp dip. Serve with a nice assortment of crackers." Spread the cream cheese on the bottom of a 8 inch square serving dish. Layer the shrimp over the cream cheese. Pour the cocktail sauce over the top. Classic! Very appealing and easy. I beat the cream cheese with 4 oz. sour cream just to make it creamier and easier to scoop up with crackers. This is great!!! I don't use canned shrimp. I use fresh shrimp and I put the cocktail sauce over the cream cheese and then put the shrimp over the cocktail sauce. It is great for parties!!! Great. Add sour cream, garlic powder, onion powder and mix all together.